Landscape Architects have training in creative and technical skills to design grading, irrigation systems, layout of drives, paths and other hardscape features, construction details, and planting plans. 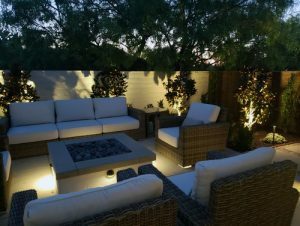 The landscape architect may work purely as a designer and consultant, or he may work for a design-build firm, which is set up to carry the design through to completion. In California, there is a law that states that in order to call oneself a Landscape Architect, one must have a four-year degree from an accredited university and have passed a national exam. In addition, once registered by the state, a landscape architect must maintain his registration from the state by paying a periodic fee. Registration is not, however, necessary to practice landscape design, and many choose not to maintain their registrations. Furthermore, the field of Landscape Architecture is broad. Landscape architects may specialize in subdivision layouts, corporate and university campuses, town centers, shopping malls, wetland mitigation, or residential design. In fact, residential design is only a small portion of the field. If you hire a landscape architect, make sure he has sufficient experience in residential design. Landscape Designers are every bit as diverse as Landscape Architects. Some are ‘unregistered’ while others are limited to designing perennial gardens. There are a great many in between. Many landscape designers have degrees in related fields, such as Ornamental Horticulture, Art, Architecture, or Landscape Architecture. Most landscape designers have good plant knowledge and can lay out paths, driveways, patios, and simple drainage. Some are very design-driven, while others work on a sales commission. Many landscape designers are in the employ of garden centers or landscape contractors. Landscape Designers’ abilities vary, depending on experience, education, and background. If possible, it is always best to visit past projects and talk to their references. See if they are members of professional organizations like Landscape Design Association or certified members of the Association of Professional Landscape Designers (APLD). Membership in these organizations indicates a commitment to professional standards and development. What is a Landscape Design-Build Firm? written by the design team at teamG7,Inc. A Landscape-Design-Build firm is a company that employs Landscape Architects and/or Landscape Designers while at the same time being the company that installs the design that it creates with their clients. As opposed to “design-bid-build”, design-build involves a single point of areas such as communication, creativity, installation, overall dollars, design, and supervision. This process also creates and encourages a more client collaborative design process between the design and construction aspects than the design-bid-build way of doing business. Another advantage is that it minimizes risks for the homeowner and reduces the construction delivery schedule by overlapping the design phase and construction phase of a project. *Excellence in integrated design-build project delivery, producing high-value outcomes. *An environment of trust characterized by integrity and honest communication. *Mutual respect for and appreciation of diverse perspectives and ideas. *A commitment to innovation and creativity to drive quality, value, and sustainability. *Professionalism, fairness and the highest level of ethical behavior. Other advantages to the Design-Build approach to a project are higher quality, singular responsibility, decreased administrative burden and reduced litigation claims. For example, design-builders meet performance needs and not minimum design requirements. The design-bid- builder way of doing business, by its nature, focuses on the dollar aspect or the “low bidder” from both the client and the contractor’s perspective thus delivering a dollar driven design rather than a client personality-driven design. This is not to say that the design-build client is not concerned about money because we all are but to this type of client the design and what it represents to them is more important. The money or the investment is a means to an end rather than the “end all.” To the design-builder type of client “relationship” and trust takes precedence over elements and dollars. restoration and so on. Some landscape contractors are capable of installing hardscape items like walks and patios in-house, while others sub-contract it out. Others still would rather stick to things they know best, which may be limited to planting design and installation. A distinction must be made here between Landscape Contractors. There are those that install new landscapes or renovate older ones, and there are those that specialize in maintenance. Landscape design-build firms are generally more expensive than firms dedicated to maintenance for a good reason. Their work requires a range of experience and equipment to ensure proper installation of a design. Companies that do both installations and maintenance generally have different crews for each function. The point is that the guy who cuts the lawn may not be the ideal one to install your new landscape. find out if they provide consulting services. Whether or not a professional will charge for a visit depends on the company. If their time is paid for, they are likely to share all of the ideas they come up with while speaking with you. You can decide for yourself whether or not those ideas are to your way of thinking. Check with local and national trade organizations such as Landscape Design Association (LDA), Association of Professional Landscape Designers (APLD), or American Society of Landscape Architects (ASLA).